Can't you wait to see it snowing and grab your skates to have that ultimate winterfun? Well I can't so I have set this Skate Rink available for you. 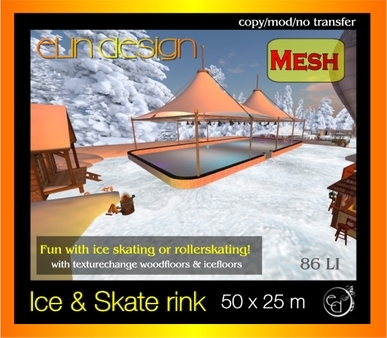 Not only in winter but also in summer you can enjoy this Skate rink! You can change the floor in different wood or ice textures. Just as you like it! The size is what you expect in RL but if no room enough you can shrink the whole thing. 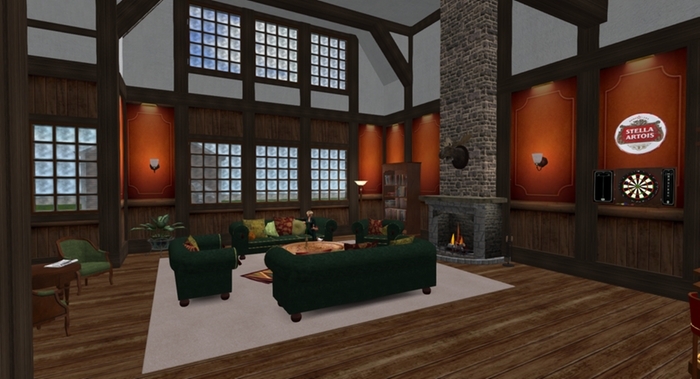 Time to build up your wintersim! Last edited by elin egoyan on Sun Nov 25, 2018 7:28 am, edited 1 time in total. Baby it's cold outside!!! Winter is coming. Well in a warm and cozy Irish pub the cold will vanish instantly. 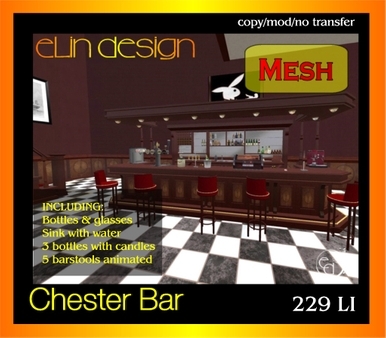 Therefore provides Shopity Elin Design the Chester Pub which is decorated with warm colors to keep the chill out. Lounge, sit at the bar, play chess (decoration) or try the Pooltable (decoration) or Dartboard (decoration). There are books to read and even a newspaper with the latest news (decoration) A perfect place to hang out with your friends. 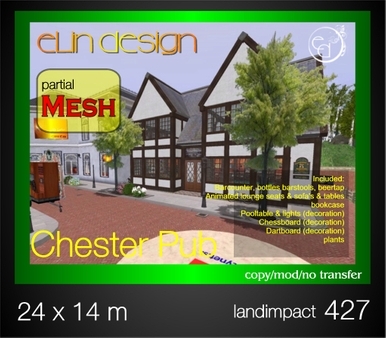 The Pub has a footprint of 24 x 14 m and has a land impact of 427. This includes the interior as seen on the pictures, altough there can be a few little diffences. Included are the nicely equipped bar counter, barstools, a bar table with barstools a lot of bottles and glasses in the bar, pooltable, chessboard, dartboard. The decoration is complete. There hangs even a moosehead on the chimney and ofcourse firetools beside the open Fire. This fully furnished pub is 100% mesh. New series of shops Palma and Mallorca! Finally lots of new shops have been released last few weeks. Shopity is known for the typical Mediterranean style house and shops and also this time you won't be disappointed. The arches, the patio's,.. it gives all a look and feel of warm and sunny days and shops full of things you really need to buy!! The Mallorca shops are nice and simple but also very detailed. The Palma shops are a bit more poshy! You can imagine to see these shop along distinctive avenues or at the Ramblas in Barcelona. The stained windows, the arches, it invites you to enter and shop till you drop! 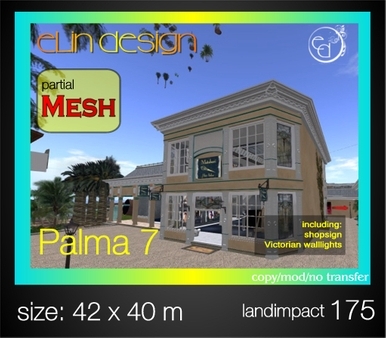 These shops are very detailed but still has a relative low land impact. 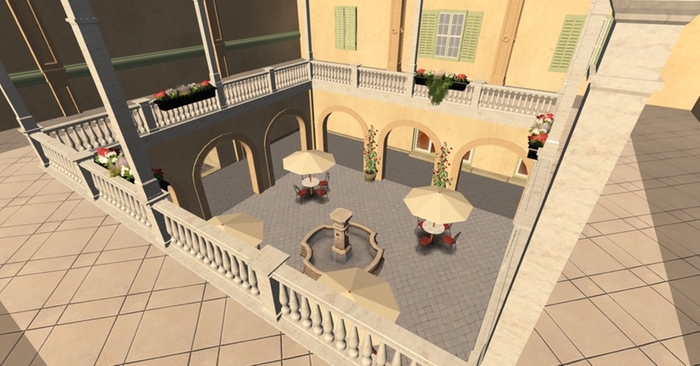 But the real wannahave is a complete ready-to-rez patio mall based on the Mallorca shops. 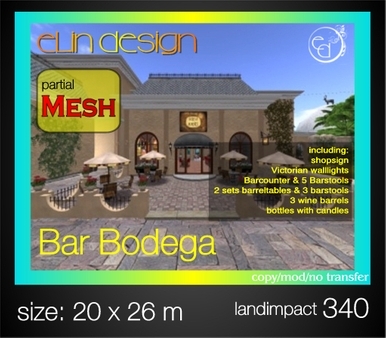 Seven shops with a lovely inner patio, a complete equipped Bar-Bodega and yes a very realistic vineyard with grapevines. Fountains, plants and trees are included. This mall is not even available in SL so I have set up this little mall at my island Godewind in Kitely so you can see what it is all about. AND.... you will find there a nice free shop you can take, to celebrate that all palma & Mallorca shops are now available at Kitely Market! 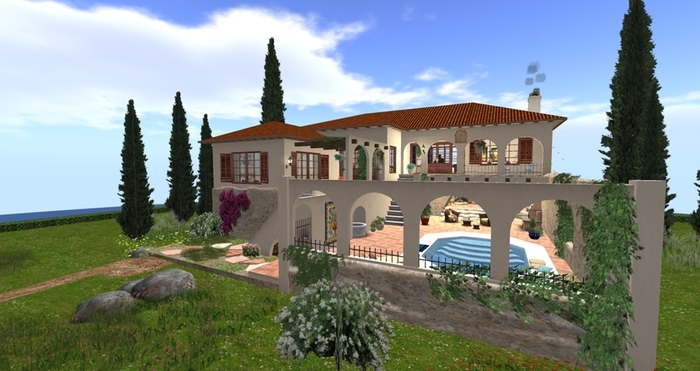 The beautiful very detailed Mediterranean house CAPRI is now available at Kitely Market. The design of this typical very popular Mediterranean villa is based on the lovely houses you can find in many, many places in Italy and Spain. A house were you can relax and lounge at the poolside overlooking the ever so blue Mediterranean. A house that you really can imagine to live in,....in Real Life! The details and decoration are so natural that after a few minutes you don't even notice, that you walk around in a virtual world but in the real world and you will feel directly at home! Outside at the swimming pool area you find not only the pool but a romantic outdoor Jacuzzi with open fire. You can sit and lounge under a pergola with climbing vine. A BBQ with wood and fire is included. At the poolside you can sunbath or sit with dangling legs in the water. A little fountain makes it complete. For your privacy the pool area is surrounded with rustic old walls covered with vines and fern. Once seen this house.... you want to have it!! !